Interesting as was the provincial life of this community; absorbing as are the reminiscences attaching to its well-known early buildings; important as vi were the activities of those who made them part and parcel of our national life, the Colonial architecture of this vicinity is in itself a priceless heritage—extensive, meritorious, substantial, distinctive. It is a heritage not only of local but of national interest, deserving detailed description, analysis and comparison in a book which includes historic facts only to lend true local color and impart human interest to the narrative, to indicate the sources of affluence and culture which aided so materially in developing this architecture, and to describe the life and manners of the time which determined its design and arrangement. Such a book the authors have sought to make the present volume, and both Mr. Riley in writing the text and Mr. Cousins in illustrating it have been actuated primarily by architectural rather than historic values, although in most instances worthy of inclusion the two are inseparable. 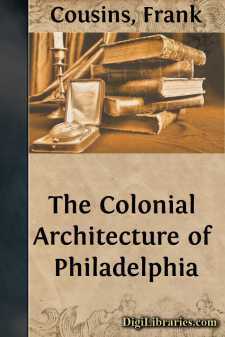 For much of the historic data the authors acknowledge their indebtedness to the authors of previous Philadelphia books, notably "Philadelphia, the City and Its People" and "The Literary History of Philadelphia", Ellis Paxon Oberholtzer; "Old Roads Out of Philadelphia" and "The Romance of Old Philadelphia", John Thomson Faris; "The History of Philadelphia" and "Historic Mansions of Philadelphia", T. Westcott; "The Colonial Homes of Philadelphia and Its Neighborhood", Harold Donaldson vii Eberlein and Horace Mather Lippincott; "Colonial Mansions ", Thomas Allen Glenn; "The Guide Book to Historic Germantown", Charles Francis Jenkens; "Germantown Road and Its Associations", Townsend Ward. Ph. B. Wallace, of Philadelphia, photographed some of the best subjects.